Find long-lasting, non-drowsy relief from sinus congestion and pressure with just one pill per day. had obstruction or narrowing of the bowel. Rarely, tablets of this kind may cause bowel obstruction (blockage), usually in people with severe narrowing of the bowel (esophagus, stomach or intestine). Hi there! We would like to learn more about your experience using our product. Please give us a call at 1-800-223-0182 M-F between the hours of 9A-5:30P ET. Have a great day! 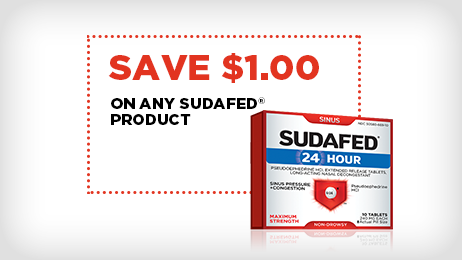 I’ve used both Sudafed 12 hr & 24hr. I prefer Sudafed 24hr. I take it before bed & sleep well all night. It starts working for me within 30min & definitely works all day. I have year round allergies & sometimes need more than antihistamines and nasal sprays. I’m also a physician & recommend this product to my patients. I took a 24 hr. Sudafed at 8 p.m. and it didn't even work through the night. I was up throughout the night with congestion. Hello! We are so sorry to hear about this! We want to help and learn more about your experience with our product! Please call, 1-800-223-0182, Monday - Friday, 9am - 5:30pm ET. Thank you! I have a history of sinus infections, and following a recent dental sinus graft I finally realized that my problem was my sinuses, not the surgery! So I took one pill and within one hour the sinus pain was gone. I only wish it came in a larger pack. I USE SUDAFED ALL THE TIME. I COULD NOT MAKE IT THROUGH THE DAY WITHOUT THE EFFECTIVE RELIEF. Does not last for 24 hours. I purchased this product expecting it to work for 24 hours, but the product only works for about 6 hours. Due to the high dosage per pill, it would not be recommended to purchase this product as it is not an extended relief as advertised. Buy a lower dosage so that when it wears off after 6 hours, you can take another if necessary. Hi there. We're sorry to hear that this product didn't work out for you and we'd like to learn more. Please give us a call at 1-888-217-2117. We're available Monday through Friday, 9am to 5:30pm ET. We look forward to speaking with you! Gets me through the night without keeping me awake. This is the only decongestant I can take that let's me sleep at night. The others keep me awake and wear off before the night is over. If I take it in the morning, it doesn't interfere with my sleep and allows me to breathe. The only problem I have is it can make my sinuses too dry. Thanks for sharing your review! We're glad you found a product that works for you, but we wouldn't expect it to dry your sinuses. We'd love to learn about your experience and see how we can help. Please give us a call at 1-800-223-0182 from 9:00am- 5:30pm ET, Monday through Friday. Have a great day and hope to hear from you soon! 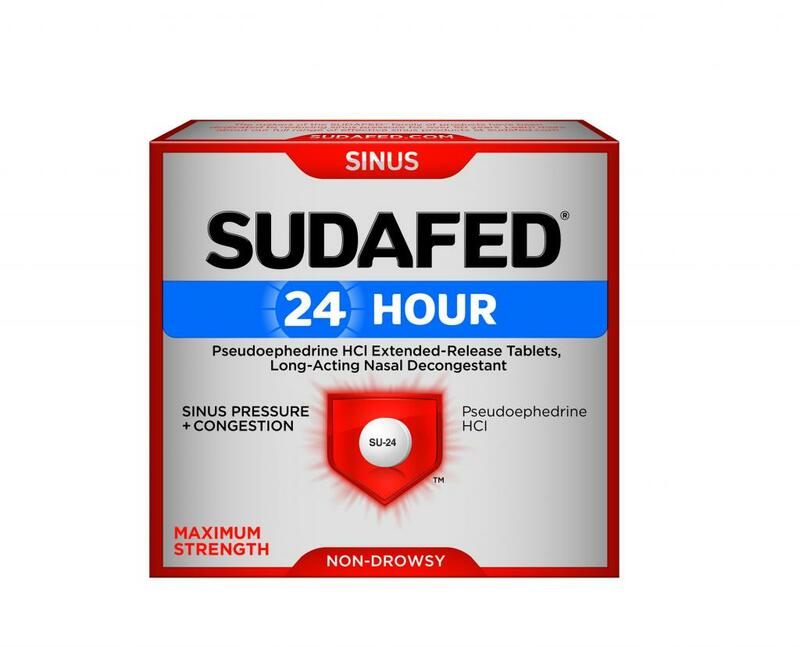 I am a long time Sudafed user, but usually use the 4-6 hour tablets. But sometimes when the barometric pressure is real low, I will wake up when the 4-6 hour wears off. I went to CVS to get the 12 hour but they did not have it, only 24 hour and 4-6 hour. I tried the 24 hour, NEVER AGAIN. My husband and I did not sleep all night. My daughter slept better but she said she had periods of wakefulness. This box should really have a bigger warning regarding the potential for insomnia. The pharmacists should be educated also. We'd like to gather more information about your experience, since this is not something we'd expect. Please give us a call at 1-800-223-0182 from 9:00am- 5:30pm EST. We hope to hear from you soon.